Seating for the Jang Dong-gun and Sngmoo Lee panel will be available in a first-come, first-served basis. Producer Barrie M. Osborne (The Warrior's Way, Lord of the Rings, The Matrix) will be at Pacific Media Expo during The Warrior's Way panel, press conference, and autograph sessions. Times: TBA. JANG DONG GUN (Yang) has starred in two of the highest-grossing box office hits in the history of South Korea. The first, Friend, earned Jang widespread critical kudos for his portrayal of a troubled high school kid who turns to a life of organized crime. Jang took home the Best Supporting Actor award at the 2000 Asia Pacific Film Festival for the role. The second of Jang’s seminal hits came in 2004 with Tae Guk Gi: The Brotherhood of War, a groundbreaking Korean epic that found him portraying one of two brothers drafted into military service. Jang’s powerful performance landed him the coveted Best Actor prize at that year’s Blue Dragon Awards. SNGMOO LEE (Writer, Director) is a respected figure in the Korean entertainment world, having won three major screenplay awards in his native country. He has penned a dozen feature screenplays and written and directed numerous short films. The independent feature film Sunday Seoul, which he wrote and produced, received a special jury mention at the 2004 Vancouver International Film Festival. After graduating from New York University’s film program in 1995 with both an M.A. and M.F.A. in cinema studies and film production, Lee became a founding member of the film department at the Korean National University of Art, where he continues to teach. Lee is the writer and director of the Korea-Japan co-production Assassin, currently in pre-production. Amy Okuda was born in Torrance, California. Amy began dancing when she was 13. Shortly thereafter she signed with an agency, which eventually led her to pursue acting. She has booked an array of print jobs around the globe, such as ads for Apple laptop computers, Verizon, American Express, and for Jamie Kennedy’s Kicking it Old School. Amy has also appeared in commercials for Canon, Shoe Carnival, Japanese soft-drink company Suntory, and radio campaign for AT&T. She landed a role on Californication with David Duchovny, and played herself in an educational online video for NASA. The web-series hit The Guild is her first recurring role, in which she was awarded a Streamy Award for Best Ensemble Cast in 2009. Amy is now a senior at University of Southern California pursuing a degree in Cinematic Arts with a minor in Communications in the Entertainment Industry. After graduation she hopes to continue her wide sphere of activity, especially in her pursuits of acting. Amy Okuda's Panel will be 1 PM on Saturday at International Ballroom East. Her autograph session will be held at 3 pm. Pacific Media Expo is pleased to welcome animator and director Hiromi Kato. Mr. Kato is known for his work as an animator on such series as Revolutionary Girl Utena, Tenshi ni Naurmon (I'm Going to Be an Angel), and Di Gi Charat Nyo. Mr. Kato currently works with renowned studio Madhouse where he served as animation director for Paradise Kiss, BECK: Mongolian Chop Squad and CLAMP in Wonderland 2. He has also provided character designs for CLAMP in Wonderland 2, and Kobato. 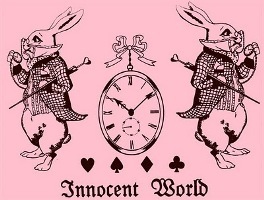 Innocent World will be participating in the Starlight Fashion Festival, PMX Fashion Show, and will be selling their designs in the PMX Fashion Hall. Stay tuned for information about our lineup of Guests of Honor for 2010.